A Yuletide Costume Ball 2001...Come And Live The Legend ! By proclamation of his Royal Highness, Prince David Alexzander; you are cordially invited to a Yuletide Costume Ball to be held on the 29th day of December in the year of Our Lord 2001. This most auspicious occasion will mark his long anticipated coronation as the future King of Riven'dale! Let it be known that all who attend, must be outfitted in authentic Renaissance costume (1400s to 1700s). Make it so! There will be food, drink and musical merriment*...with a touch of mystery and magick. A nite you'll never forget! For complete information, please contact Richard and Roger at the address below. But tarry not good people. This event is timeless in every way! 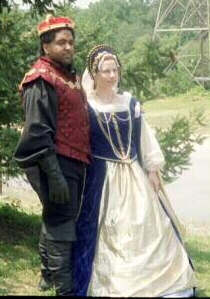 *Music will be provided by Flatpickin' and Pluck, featured musicians at the 2001 Maryland Renaissance Festival!